Volunteer project: Teaching English and sharing your culture with school children and the local community of Songkhla is the main aim of this project. For the past 7 years that the project has been running, volunteers have contributed to a positive change in the local community by helping many children and adults improve their English skills and open up to different cultures. This year, international volunteers will keep on developing the potential of the local community, teaching and encouraging school children and local people to practice English and learn about other cultures. Volunteers themselves will have an opportunity to experience local culture closely while living in the community. Volunteers will work as English teachers in a primary school. They will prepare their lessons by themselves, with some advice from the local teachers at the school. Volunteers are welcome to take creative approach and use games, songs, storytelling, dancing to engage students. Activities should focus on communication, listening and speaking. Teaching certificate is not required but motivation, creativity and enthusiasm for teaching are important. Leisure activities: There are many beautiful tourist attractions in Songkhla province. Volunteers can visit the Hat Yai Municipal Park, Samila Beach and Songkhla Old Town. Hat Yai Municipal Park is the biggest public park in Hat Yai city where local people come to relax. There is a majestic statue of Standing Buddha on the top of the Ko Hong hill from where you can see the beautiful view of the entire Hat Yai city. Samila Beach is the main beach of Songkhla province. There you can see the Golden Mermaid which has been the symbol of Songkhla for over 50 years, the Cat and Mouse, and hear the wonderful stories about the beach and the statues. Songkhla Old Town consists of nicely preserved architecture of various styles, old temples, beautifully decorated walls, and great places to eat. Duration of the project: 1 to 12 months. The volunteer placements start on the 1st of the month. Orientation: Volunteers are required to participate in an orientation week in Songkhla from the 1st to the 5th of the month before the start of the project. Accommodation: Volunteers will stay with a local host family. Please, bring your sleeping bag. Volunteer project: Teaching English and sharing your culture with school children and the local community of Nakhon Ratchasima is the main aim of this project. For the past 8 years that the project has been running, volunteers have contributed to a positive change in the local community by helping many children and adults improve their English skills and open up to different cultures. Learning English and developing the skills to communicate with people from other countries is considered a high priority in primary schools in Thailand. Exposure to different languages and cultures allows these students to build their self-confidence, overcome their barriers and get used to interacting with foreign people. The continuation of this project is essential for the students’ improvement and success. Leisure activities: There are many beautiful tourist attractions in Nakhon Ratchasima province. Volunteers can visit Khao Yai National Park and Phimai Historical Park. Khao Yai National Park is the first national park in Thailand, comprising of rainforests and grasslands. Sightseeing in Khao Yai is one of the best things to do in Nakhon Ratchasima. There are more than 3,000 kinds of flowers, 250 kinds of birds, and 67 kinds of mammals like elephants, tigers, gibbons, deer, and boars there. It is relatively easy to see number of interesting animals in the park. Phimai Historical Park is one of the largest and most impressive Khmer temples of Thailand, located in the town of Phimai. Duration of the project: 1 to 4 months. The project is running from June to September and from November to February. The volunteer placements start on the 1st of the month. Volunteer project: Volunteers in this project will be teaching in a small primary school with 60-70 students. Even though the school is located in Krabi, which is a popular tourist region, it is far from the most visited spots and beaches. The local people and children rarely meet tourists, and have almost no contact with other cultures. Teaching English and sharing your culture with school children and the local community of Krabi is the main aim of this project. Volunteers will organize classes and activities in order to motivate and encourage children and adults to improve their English skills and learn about different cultures. Volunteers can also join the agriculture activities in the school garden like growing mushrooms, planting morning glory and other local vegetables, etc. Leisure activities: Krabi is known for its outstanding natural beauty and unique attractions. Volunteers can visit the Emerald Pool, the Tiger Cave Temple (Wat Tham Sua) and Ao Nang Beach. The Emerald Pool is a warm, turquoise, crystal clear pond in the Thung Teao Forest Natural Park where you can take a swim. The Tiger Cave Temple (Wat Tham Sua) is one of the most interesting temple complexes in Southern Thailand, as the monks live and worship within a maze of natural caves in an overgrown jungle valley. Ao Nang is a very beautiful and popular tropical beach. Accommodation: Volunteers will stay with a local host family or in the teacher's house in the school. Please, bring your sleeping bag. Volunteer project: Volunteers will help in a school for disadvantaged and poor children from the countryside of Sakon Nakhon. The school is under the royal foundation and offers education, food and accommodation to children who have no parents, children from poor families, and children from very remote areas. Students from primary to high school level (7-18 years old) receive not only education but also a home at the school. Developing an interest in learning English is crucial for these children and can benefit them significantly in the future. International volunteers play an important role in this process by providing fun and engaging English classes and cultural exchange activities. Volunteers will teach English to school children aged 7 to 18 years. They will prepare basic English lessons and easy conversation topics. Volunteers are expected to be creative and use activities such as games, songs, storytelling, art, performance to encourage English practice and communication. Teaching certificate is not required but motivation, creativity and enthusiasm for teaching are important. Leisure activities: Having a long, culturally diverse history, Sakon Nakhon features a unique mixture of natural attractions, sacred spots and ancient traditions. Volunteers can visit Phra That Narai Cheng Weng, Phu Phan National Park, and Wat Tham Pha Daen. Phra That Narai Cheng Weng is an ancient temple from the 11th century which is believed to have been built entirely by women who competed with men. The Phu Phan National Park covers a wide jungle area in the Phu Phan Mountains of Isaan. The park has numerous waterfalls and unusual rock formations. Wat Tham Pha Daen is a beautiful hilltop Buddhist temple with a golden pagoda, big rock carvings and panoramic views over the surrounding countryside. Accommodation: Volunteers will stay in the school dormitory or in the teacher's house in the school. Please, bring your sleeping bag. Volunteer project: Volunteers will help in a school for disadvantaged and poor children from the countryside of Khon Kaen. The school is under the royal foundation and offers education, food and accommodation to children who have no parents, children from poor families, and children from very remote areas. There are currently 829 students from primary to high school level (7-18 years old), who receive not only education but also a home at the school. Volunteers can also join after-school activities with the students. This would be a good opportunity for cultural exchange, sharing experiences and building friendships with the kids. Leisure activities: Khon Kaen province houses a number of historical, cultural and natural attractions. Volunteers can visit the Ba Luang Waterfall Forest Park and the Phu Wiang Dinosaur Museum. The beautiful Ba Luang Waterfall is located in the Dongmoon National Forest and is full of water year round. The water cascades over sandstone boulders to create a unique stair-like face. The Dinosaur Museum is part of a fossil research center located in the Phu Wiang area of Khon Kaen province where numerous fossils of Carnosaurus, Siamosaurus, Tyrannosaurus and other species dating back to the Jurassic period have been excavated. Volunteer project: Volunteers will help in a school for disadvantaged and poor children from the countryside of Satun. The school is under the royal foundation and offers education, food and accommodation to children who have no parents, children from poor families, and children from very remote areas. There are currently 919 students from primary to high school level (7-18 years old), who receive not only education but also a home at the school. Teaching English and sharing your culture with these children is the main aim of the project. Volunteers will organize classes and activities to inspire students to learn English, and also to broaden their perspectives and open their minds to different cultures. Leisure activities: Satun is attracting visitors with its rich natural beauty and cultural diversity. In the free time, volunteers can visit Koh Lipe Island and Golden Dragon Beach. The small island of Koh Lipe in the Andaman Sea near the Malaysian border is a true paradise with its white sandy beaches and turquoise blue waters. It is part of Tarutao National Marine Park which encompasses 51 islands and hundreds of coral reefs teeming with fish and wildlife. The Golden Dragon Beach is a long sand ridge beach, stretching for 4 kilometers in the middle of the sea between two islands. Volunteer project: Volunteers will help in a school for disadvantaged and poor children from the countryside of Buriram. The school is under the royal foundation and offers education, food and accommodation to children who have no parents, children from poor families, and children from very remote areas. There are currently 813 students from primary to high school level (7-18 years old), who receive not only education but also a home at the school. The school also teaches occupational certificate courses. Leisure activities: Buriram is a land of volcanoes, sandstone sanctuaries, beautiful silk and rich culture. Volunteers can visit Phanom Rung Historical Park, Play La Ploen and Khao Kradong Forest Park. Phanom Rung stone castle built on top of an ancient volcano is probably the most majestic and best restored of the Khmer temples in Thailand. Play La Ploen is an impressive flora and adventure park with gorgeous flower gardens featuring plant species from all over the world. Khao Kradong Forest Park is an extinct volcano. Near the top of the volcano there is a huge monument of a gold Buddha, the Suphatthara Bophit, considered to be the symbol of Buriram. Volunteer project: Thaksin University is a public university in Muang Songkhla District, Songkhla Province, in Southern Thailand. It is about 20 kilometers from Hat Yai District. Previously, Thaksin University was a branch campus of Srinakharinwirot University. Afterwards it grew in size and eventually became an independent public university in 1996. The aim of the university is to promote and preserve the culture of Southern Thailand. 2) Economic aspects such as important products, main exports, etc. 3) Social and cultural aspects such as greetings, leisure activities, food culture, etc. 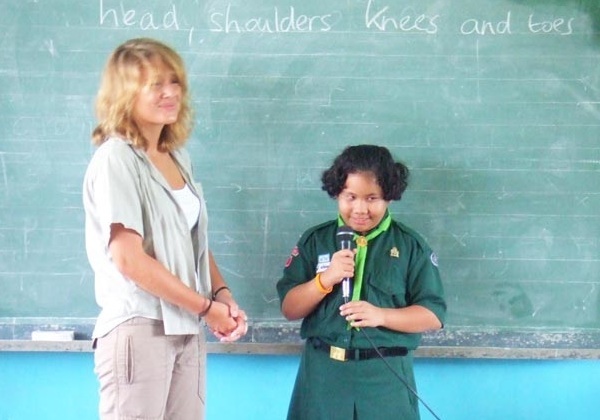 4) Other topics related to volunteer's interests such as sport, tourism, life experience, etc. Volunteers can show pictures related to the talk and organize a discussion on the topic with the students. Volunteers can join the students for some outdoor activities and excursions in the community, the city center, and some tourist destinations. During such activities, students tend to be more relaxed and find it easier to learn and practice English than in the classroom. Volunteers can help them improve their English communication skills in different settings and fun activities. The volunteers will be working with 2nd to 4th-year Economics students in the following modules: English for Economists; World Economy; Thai Economy (Tourism); Introduction to Economic Research (Interview practice). Volunteers will be also asked to hold an informal English conversation class for professors and lecturers of the university. This activity aims to encourage faculty members to practice English with the hope to increase their confidence for using English in their future career. Duration of the project: 1 to 5 months. The project is running from mid-August to the end of December (1st semester) and from mid-January to mid-May (2nd semester). The volunteer placements start on the 1st of the month. Accommodation: Accommodation is provided at the university. Please, bring your sleeping bag. Volunteer project: In Thailand, many universities operate demonstration schools as part of their teacher-training programs. These schools have a greater degree of freedom in their operations than most state schools and are generally viewed as providing higher-quality education. The volunteer project will support one such school in Mae Chaem district of Chiang Mai Province. It is an alternative school and learning center for hill tribe children who come from poor families and very remote mountain areas. The learning center provides the children with free education, accommodation, food and occupation training, and plays an important role in preserving their culture. The students are from the Karen and Hmong hill tribes. • Creative English teaching – The aim is to give children and local people an opportunity to communicate in another language and get in touch with a different culture through informal English lessons. The volunteers will practice English with students in the school. In their teaching, volunteers will use intercultural activities, games, songs, storytelling and dancing, focusing on communication, listening and speaking. • Farming - Volunteers and students will work together on the school farm in 5 different occupation training programs: cow farm, pig farm, fish and frog farm, rabbit farm and chicken farm. They can also plant more vegetables for the school lunch project. • Ecotourism – There are many interesting places to visit in the community such as a Buddhist temple, a waterfall, a national park, etc. The volunteers will visit these places and will help keep them clean by collecting garbage and promoting recycling. Leisure time: There is so much to see and do around Chiang Mai. Volunteers can visit local temples, the Walking Street market and Doi Inthanon National Park. There are over 300 temples in Chiang Mai, of which the most popular is Wat Phra That Doi Suthep. You can enjoy the unique atmosphere at the Walking Street market and buy handmade souvenirs. There is also a night Bazaar Market in the center of Chiang Mai city with shops stretching over 2 kilometers. Doi Inthanon National Park, also known as "The Roof of Thailand", is located in Mae Chaem district and is part of the Himalayan mountain range. Doi Inthanon is the highest mountain in Thailand. Accommodation: Volunteers will stay in the school. Please, bring your sleeping bag. Volunteer project: The project takes place in the rural area of Songkhla province, Southern Thailand, in the small village of Ban Ton San. The main occupation of the locals is rubber plantation and most of the villagers are Buddhists. The life in the village revolves around Community Living, Learning by Doing and Cultural Diversity. • English teaching – Creative teaching through games, songs, storytelling, art or performance, to encourage school children and local people to speak English and get a feel of different cultures. • Construction – Volunteers will help set up the learning center in the village, cleaning the rooms and meeting area. They will also continue the construction and painting work started by previous participants. Local villagers will teach the volunteers and will help with the construction. This is a good opportunity to learn the Thai way of building. Accommodation: Volunteers will stay with a local host family or in the learning center in the village. Please, bring your sleeping bag. Location: Ban Ton San, Songkhla Province. Songkhla is a coastal province known for its ethnic diversity and its unique traditions, dialect and folk entertainment. Volunteer project: Volunteers in this project will support an emergency rescue team in Hat Yai City, providing first aid, bringing patients to the hospital and helping people who have been in an accident. The volunteers will work alongside rescue professionals and trained volunteers and staff. Hat Yai is the largest town in Songkhla Province and the economic center of Southern Thailand. It is also an extremely popular tourist spot visited by many travelers, with the biggest number coming from nearby Malaysia and Singapore. There are many accidents happening on the road every day, especially on festival days. Sometimes foreign tourists are involved which makes the need of English-speaking members in the team even greater. Furthermore, the project hopes that Thai staff and international volunteers can share and learn from each other while working together. The first aid team works 24/7. The team can be divided into 2 smaller teams, with 13 assistants each, to cover the day shift (8am-8pm) and the night shift (8pm-8am). The teams will switch shifts every 15 days. However, the volunteers can plan and decide with the staff on a different work schedule. Besides emergency cases, the volunteers can help with other tasks such as taking bedridden patients from their home to the hospital, or from the hospital to their home. Special requirements: Volunteers need to have experience in first aid or emergency response training. Certificate of first aid, rescue training, or medical or relevant study is required. Volunteer project: The project supports a local organic farming learning center. This is a famous private local organic farm in Songkhla. The manager is a local organic farm philosopher who has been a tropical agriculture supervisor. The volunteers are expected to learn about tropical plants and help in the organic farming. Leisure activities: Visiting the community and local temples. Accommodation: The volunteers stay in a host family, mattress and fan is provided. Meals are vegetarian. Volunteer project: The officers of The Institute for Southern Thai Studies are enthusiastic to have a language and culture exchange with international volunteers and they welcome international volunteers’ contribution in their culture seminar activities. The Folklore museum of the Institute of Southern Thai Studies is located on the hill on Koh Yor island, Songkhla with fantastic views over the Songkhla Lake and aquaculture farms. The volunteers in this project will support the activities of the Folklore museum. They will learn about Southern Thai culture, will receive tour guide training and will assist tourists visiting the site, will clean the antiques in the museum. Special requirements: Cultural respect, open mind and love for learning and sharing is needed. Accommodation: The volunteers will stay in the museum’s accommodation or home stay with the Museum staff. Location: Yor Island, Songkhla. Songkhla is both one of Thailand's most important port cities and a coastal province known for its ethnic diversity and its unique traditions, dialect, and folk entertainment. Volunteer project: Wat Pa Khuan Niang is a Buddhism temple that strongly supports local culture. The temple welcomes people to meditation practice and Buddhism learning every day. People can come for a day of meditation or stay overnight at the temple as long as they would practice meditation. The project welcomes participants who are interested to support the activities in the temple and to learn about Buddhism. The volunteers are expected to learn and practice meditation in the temple. They can also learn more about Buddhism from the monks, nuns and local people who always come to practice meditation. • Teaching basic English to the monks and local people at the temple, and in a local school in the community in June-September and November-February. • Supporting temple and community activities and learning about Buddhism. • Practicing meditation with the local people. • Renovation work, cleaning up the temple. • Preparing for ceremonies together with local Thai people. Special requirements: This project requires hard work and strong motivation. Leisure activities: Visiting the Floating Market and Hatyai downtown, Rattaphum Temple, Khohong Hill, Tone Nga Chang Waterfall. Location: Wat Pa Khuan Niang Temple, Hatyai, Songkhla. Hat Yai (frequently spelled Had Yai) is the largest city in southern Thailand, located near the border of Malaysia and populated by nearly 800,000 Thais. Volunteer project: This volunteer project focuses on education, cultural exchange and community development, and takes place in two different countries - Thailand and Cambodia. Volunteers will run non-formal education programs for children in both countries while learning about the long history and culture of Suvarnabhumi or the Land of Gold, which in Buddhist scriptures refers to the countries of Cambodia, Laos, Myanmar and Thailand. Teaching English and sharing your culture with school children and the local community is the main aim of the project in Nakhon Ratchasima. Past volunteers have contributed to a positive change in the local community by helping many children and adults improve their English skills and open up to different cultures. Learning English and developing the skills to communicate with people from other countries is considered a high priority in primary schools in Thailand. Exposure to different languages and cultures allows these students to build their self-confidence, overcome their barriers and get used to interacting with foreign people. The volunteer project is essential for the students’ improvement and success. In Cambodia, the volunteers will work with a non-profit education center which aims to provide free alternative education for children, and also to create opportunities for local youth and adults to learn languages, computers, and to access global information and education through the internet and the center's library. For many local people, the education center is also the first place where they can meet and interact with people from different countries and cultures. Duration of the project: 2 months. The project is running from June to September and from November to February. The volunteer placements start on the 1st of the month in Thailand. The 1st month will be spent volunteering in Thailand, and the 2nd month in Cambodia. Volunteers are required to participate for the full 2-month period in both countries. Orientation: Volunteers are required to participate in an orientation week in Songkhla, Thailand from the 1st to the 5th of the month before the start of the project. Accommodation: In Thailand, the volunteers will stay with a local host family. In Cambodia, accommodation is provided in a guesthouse. Please, bring your sleeping bag.